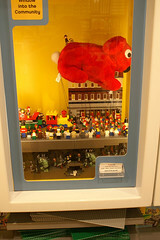 The most recent TexLUG display installed this last week at the LEGO Brand Store in Baybrook Mall in Houston, Texas. More pictures can be found in My Flickr Gallery. The display was a combined effort by Matt Sailors and myself. Matt created the upper display with the parade, and then asked me to create a base for it. I, of course, added my own medieval twist on the whole thing.